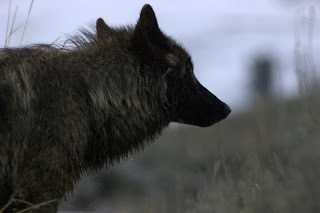 This wolf crossed the road in front of us near the old Picnic stop in the Lamar valley. We then looked to the left and saw it's partner still on a kill. We couldn't see the kill but knew it was there based on all of the birds hanging around. 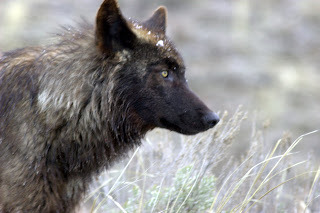 This is the wolf that was still on the kill and then left and gave us a good opportunity to get pictures. Then as we were heading back we saw a large pack of spotting scopes and knew there was some action. 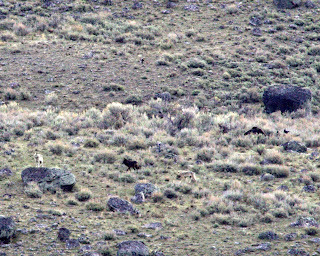 Three wolves from the Agate Pack and a grizzly on what we think is a bison kill. The video below is through David's spotting scope. We will get more up later but we need to get to work, the sun is actually shining. No snow!!! Evening update: After an exciting (close to once in a lifetime) morning we came back and took a quick brek. Then we went out to set up another SBU experiment in Gardiner Basin. The weather the day before didn't make for the best 24h sampling so we started over again. Tomorrow we are going to head down to Old Faithful and Canyon and then sample our SBU expeiment in the afternoon.